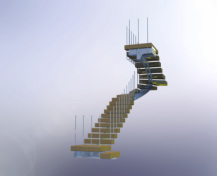 In architecture, stairs design is a tricky one. It is a task limited by 3D spaces, access directions and construction methods, aesthetics, materials, proportions and much more. Eric Werbey, a neighbor of mine, works as a constructor of stairs and pergolas. He asks me to design and create all the relevant files to create unique and quite cumbersome stairs for existing houses, spaces and bring new functionality to existing places. Stairs are like a monument one can not ignore. These stairs were very hard, due to awkward angles left in the original space. The angle between the wings is 75 degrees and an air condition vent exists in the turning point, also, head room is only reachable at a specific area. Mr Fux wanted a very heavy looking staircase. He explained me that he knows what he wants and I must not try to change his will. the entire solution was designed and build for minimal weldings, minimal scaffoldings and absolute accuracy. The metal was all laser cut and assemble by eric in less than a 2 working days, including sand and paint. The matan family wanted to create an easy access to an existing gallery where a huge storage space waited to be used. In the given space, there was a real issue to use the existing wall of the house to support the construction. a nice and unique solution was designed to bridge the challenge.